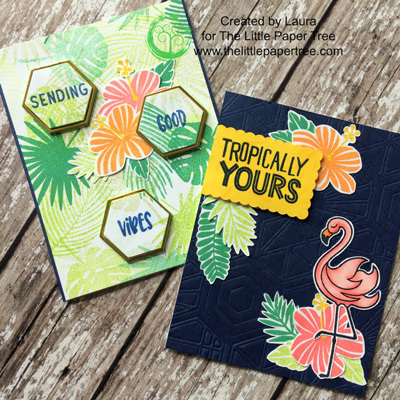 Today I’m going to share two cards I made using the Cabana Tile Die set. It’s actually part of a trio of cards I made all from the one die! I was planning to share them all in one post, but it was A LOT of information so I’m starting off with these two and you’ll see the third in the upcoming weeks. This first card was the last one I finished (out of five cards – I told you I made a lot!) but the design was the first concept I had when I got the SOA box. When I saw those beautiful Cabana Tile Dies I knew they would look really great embossed and showcased as a statement background panel. I will say this: you can totally do this technique with a Cuttlebug (and I actually started my project using it) but I think a Big Shot Plus (or any other A4 sized machine) makes it SO much easier and faster to do. Once I switched over to the larger machine, I created three versions of this on different colored card stock in just a few minutes. To create the embossing pattern with dies, you simply need to add your embossing pad underneath the cardstock (between the card and the bottom B cutting plate) to keep the die from cutting through your card. So instead of cutting the shape, you are left with the pattern embossed into the card instead. To make this process faster, I kept the dies attached together (as they came in the packaging) except I snipped off one of the hexagons (that was similar to one of the others) off the end so I was embossing with five of the dies at once. Then, I just continued to move it around the card and run it through my die machine until the panel was filled in. If you’ve already clipped your dies apart, don’t worry! You can just place them (in any desired layout) and tape together with purple or Post-It tape) and it’ll work just as fine. So far, I’ve made five cards from the kit, so before I started designing anycard I stamped several versions of each images (across ALL the stamp sets) in various colors. I don’t have the dies, so I cut them out by hand. The designs are fairly simple to follow and it was quick enough to cut them out (except for the flamingos – my perfectionist self had to get in there with a craft knife.) Now that I had nice choice of images to choose from, I tried to be minimalistic and picked a Copic coloured flamingo, a few leaves, and a flower because I wanted that beautiful background (I worked so hard on!) to really shine. Working with a piece of yellow cardstock I cut with a scalloped rectangle die, I stamped the sun image from the Fearless Pursuit stamp, with Versamark to give it a subtle design. I hit that with the heat gun and then the powder tool. Then, I heat embossed the Tropically Yours sentiment from the stamp set from the same name using Avery Elle’s Sapphire Pigment Ink and Ranger Clear Embossing Powder. To finish off the card, I used Tombow to adhere the panel to a card base made from Neenah Solar White. And onto the second card! I had so much fun stamping all the leaves from the wonderful Leave Me in Paradise stamp set. The set consists of a wide selection of foiliage that are perfect for lots of different styles. I used them as a tropical wallpaper on this card, but I’m thinking they’ll be wonderful to use on masculine cards or as border patterns, too! I trimmed a piece of Neenah Solar White to 4.25” x 5.5”, added almost every leaf (from the set) onto various acrylic blocks, and stamped them (all over the panel) using various shades of green. I used a mixture of Distress Inks (as they are more transparent) and a Distress Oxide (for a more opaque look) to make it look more visually interesting. When creating backgrounds from stamps, I find it easier to start with the biggest stamps in lighter colours. After that I stamp the smaller images with the lighter colours before repeating the process with darker shades. I feel this allows me to keep the sizes and colours balanced as I go. After I had the panel covered, I took the hexagon (I cut off earlier) and snipped it again by detaching the outermost hexagon frame. I laid scrap hexagon die cut where I felt they would look best on the panel so I would know where to place my stamps. Then I stamped some of the sentiments, included in the Good Vibes Borders stamp, using Avery Elle Sapphire Pigment Ink. The words “Good” and “Vibes” were on the same stamp so I simply covered up the words I didn’t want to stamp with a post-it note whilst I was inking it up. Then I removed the post-it and stamped the words in the middle of each area where I was going to cut a hexagon out. Then I went over to my Cuttlebug and cut the hexagons out of the stamped panel. I also cut the hexagons three times from gold mirror cardstock, and another SIX times from green craft foam (I got at my local discount store.) I took the outer frame off of each hexagon die cut (with the stamped words) and put them in the back of the Avery Elle Storage Pocket the stamp is stored in. You never know when you might need a pretty hexagon frame! I cut a 4.25” x 5.5” panel from Navy cardstock and used my Fiskar’s Trimmer to cut the stamped panel down ⅛” on each long side. I adhered the navy panel to a card base made from Neenah Solar White, and the stamped panel to the navy. Last thing to do was to glue my hexagons into place. I took the craft foam hexagons (outer frame included!) and glued it with Tombow into the each of the hexagon cut outs on the card base. Next I glued the gold mirror hexagon frames (outer frames only– and yes, I saved the mirror hexagons for a later date! 😁) onto each foam hexagon. Last, I added another craft hexagon (inside only– no frame!) to each hexagon which I topped off with my stamped hexagons. Whew! That’s a lot of hexagons!! Of course I couldn’t leave well enough alone and had to add a few embellishments! Remember all the stamped images I told you I had? I’m so glad I did this because I could play around with different layouts and colours that coordinated with my design. I added a flower and a few leaves from the Tropically Yours stamp under the bottom craft foam square (of the middle hexagon.) Luckily the glue hadn’t dried yet (probably since it was adhering with craft foam) so I was able to pull the edges up and slip the flowers underneath. Yay!Oh, and i also gave the flower a bit of love from my Wink of Stella pen! That’s all I have for you today. I have so many more ideas and can’t wait to share them with y’all! Have you gotten your Stamp of Approvalbox yet? There’s a limited supply – order soon so you don’t miss out! Don’t forget to use TLPTLAURA10 for a 10% discount at checkout!